John 4:22 (KJV) Who is the genuine God??? Who are the genuine covenant people??? MIAMI (CBSMiami) – When asked why he would risk his job and speak publicly, Detective Thomas Fiore considered the question carefully before answering. Even inside the hospital, he says he was stopped from doing his job – investigating reports of missing drugs from the VA pharmacy. When the amount of a particular drug inside the pharmacy doesn’t match the amount that the pharmacy is supposed to have, a report, known as a “discrepancy report” is generated. Normally it was his job to investigate the reports to determine if they were the result of harmless mistakes or criminal activity. But all that changed, he said, about two years ago. “I was instructed that I was to stop conducting investigations pertaining to controlled substance discrepancies,” he recalled. He said he was personally told to stop investigating them by the hospital’s chief of staff, Dr. Vincent DeGennaro. Fiore said he decided to contact CBS4 News following our report last month on the death of Nicholas Cutter, a 27-year-old Iraq War veteran with PTSD who died from a cocaine overdose inside the Miami VA’s drug rehab center. Fiore said it was well-known that Cutter was someone who not only abused cocaine but also smuggled it into the hospital. He said he reported it to his superiors in the weeks before Cutter’s death last year but no action was taken. Fiore said he was amazed the staff continued to give him passes to leave the building. “He would have been number one on my list of people I would want to stay at the facility, not just for his safety but for the safety of all the other veterans that are in the medical center,” he said. When Cutter’s body was found on June 1st, Fiore said the staff inside the rehab center failed to immediately call him. Cutter’s room should have been considered a crime scene. Instead, the staff bagged up the body and cleaned the room. He said he only learned about the death two days later. “I was very shocked to be honest with you that I wasn’t called,” he said. Fiore claims the way the hospital handled Cutter’s death was typical of the way they try to handle most problems. He said they prefer to keep things as quiet as possible rather than fix the problem. Referring to drug dealing on the hospital grounds, Fiore said, “It’s been a problem for a while, for a very long while.” But administrators refuse to address it. Fiore said the dealing usually takes place near the front entrance to the hospital, where patients and other gather to smoke. Patients will sometimes sell portions of the prescriptions they just filled. Other individuals will bring illegal drugs onto the grounds to sell. He said he has seen individuals in the drug treatment program time their smoke breaks so they can do downstairs and meet their dealers. The VA police, who are all sworn federal law enforcement officers, can do little to stop it. The handful of VA police officers who patrol the hospital grounds are easy to spot since they are always in uniform and are well-known to patients. Fiore said he even found someone with undercover experience who was ready to do it. He said he presented his plans to his superiors, but never heard back from them. Fiore said another reason drug dealing became a problem was the lack of working surveillance cameras inside and around the hospital. The lack of security cameras was an issue the Inspector General raised in its report earlier this year into Cutter’s death. They said the cameras had not been working for at least six months prior to Cutter’s overdose. In fact, Fiore said, the cameras have not worked for at least four years. In 2010 he was assigned the responsibility of conducting a “vulnerability assessment” of the VA facilities in South Florida. He noted the problem with the cameras back then. As a result of his report, he said the Miami VA was allocated money to improve security. He said he believes the amount was somewhere between $2.5 million and $3.5 million. But he doesn’t know what happened to the money. Fiore said in addition to ignoring the drug problem at the hospital, he also believes the hospital fails to address allegations of patient abuse. He said rather than deal with these issues as criminal matters, the hospital handles them administratively. “A lot of times to make the problem go away they just take that individual staff member, they pick them up and they relocate them to a whole different area” of the hospital, Fiore said. A spokesman for the VA wrote to CBS4 News saying that all cases of patient abuse are taken seriously and staff members are often moved to other parts of the hospital while the investigation is conducted. A final area of concern for Fiore is theft. “Theft is rampant,” he said. He estimates there are millions of dollars in theft every year from the Miami VA, everything from computers to medical equipment. “We’re talking government property, we’re talking about things the taxpayers are buying,” he said. Fiore, who served four years in the Marines before joining the VA police department, knows he may be fired for speaking publicly. He said he thought about maybe being an anonymous source, but believed people would be more apt to believe him if they saw he was willing to talk openly. He said he hopes his comments will encourage more congressional oversight. If you would like to contact CBS4′s Jim DeFede, his email is jdefede@cbs.com. The financial crisis that followed the collapse of U.S. investment bank Lehman Brothers in 2008 did more than wipe out billions in wealth and millions of jobs. It also sent birth rates tumbling around the world as couples found themselves too short of money or too fearful about their finances to have children. Six years later, birth rates haven’t bounced back. We tend to think economic growth comes from working harder and smarter. But economists attribute up to a third of it to more people joining the workforce each year than leaving it. The result is more producing, earning and spending. Now this secret fuel of the economy, rarely missing and little noticed, is running out. Births are falling in China, Japan, the United States, Germany, Italy and nearly all other European countries. Studies have shown that births drop when unemployment rises, such as during the Great Depression of the 1930s. Birth rates have fallen the most in some regions that were hardest hit by the financial crisis. “It’s like health — you only realize it exists until you don’t have it,” says Alejandro Macarron Larumbe, managing director of Demographic Renaissance, a think tank in Madrid. The drop in birth rates is rooted in the 1960s, when many women entered the workforce for the first time and couples decided to have smaller families. Births did begin rising in many countries in the new millennium. But then the financial crisis struck. Stocks and home values plummeted, blowing a hole in household finances, and tens of millions of people lost jobs. Many couples delayed having children or decided to have none at all. Couples in the world’s five biggest developed economies — the United States, Japan, Germany, France and the United Kingdom — had 350,000 fewer babies in 2012 than in 2008, a drop of nearly 5 percent. The United Nations forecasts that women in those countries will have an average 1.7 children in their lifetimes. Demographers say the fertility rate needs to reach 2.1 just to replace people dying and keep populations constant. — A return to “normal” growth is unlikely: Economic growth of 3 percent a year in developed countries, the average over four decades, had been considered a natural rate of expansion, sure to return once damage from the global downturn faded. But many economists argue that that pace can’t be sustained without a surge of new workers. The Congressional Budget Office has estimated that the U.S. economy will grow 3 percent or so in each of the next three years, then slow to an average 2.3 percent for next eight years. The main reason: Not enough new workers. — Reduced pay and lifestyles: Slower economic growth will limit wage gains and make it difficult for middle-class families to raise their living standards, and for those in poverty to escape it. One measure of living standards is already signaling trouble: Gross domestic product per capita — the value of goods and services a country produces per person — fell 1 percent in the five biggest developed countries from the start of 2008 through 2012, according to the World Bank. — A drag on household wealth: Slower economic growth means companies will generate lower profits, thereby weighing down stock prices. And the share of people in the population at the age when they tend to invest in stocks and homes is set to fall, too. All else equal, that implies stagnant or lower values. Homes are the biggest source of wealth for most middle-class families. Births might pick up again, of course. In France, where the government provides big subsidies and tax breaks for children, birth rates are back where they were in the early 1970s. In other countries, women who put off having children in the recession might play catch up soon, as they did after World War II. Demographers note that women were having children later in life even before the crisis, and so births are likely to rise anyway. But even a snapback in births to pre-recession levels will leave families much smaller than they were decades ago, a shift that has already affected industries and economies around the world. In Japan, sales of adult diapers will exceed sales of baby diapers this year, according to Euromonitor International, a marketing research firm. In Germany and Italy, towns are emptying as families shrink and there aren’t enough children to replace older ones who are dying. And in South Korea, where births have fallen 11 percent in a decade, 121 primary schools had no new students last year, according to Yonhap, the country’s government-backed news agency. Park Hyun-kyung, a 34-year-old hospital administrator in Daegu, South Korea, says she would like to have three children, just like her parents. But she and her husband have decided to stick to one, if they have any. “Most jobs are not secure enough to allow couples to have a baby and raise kids,” she says. In China, where the working-age population is set to shrink next year, the government is relaxing a policy that had limited many families to one child. It might not help much. Chinese are choosing to stick to one on their own. Lei Qiang, a logistics manager in Shanghai with a 2-year-old daughter, has ruled out another child. “I just couldn’t think how expensive it is to have two,” says Lei, 39. Economists are worried not just because growth is stalling in working-age populations. Their numbers as a share of the total population in many countries is falling. Economists like to see this share of total population rise, because it means more people are earning money, expanding the tax base and paying for schools for the young and pensions and health care for the old. Before the recession, the number of these potential workers as a proportion of total population was falling in three of the world’s six biggest developed economies — Japan, Germany and Italy. Now the proportion is also dropping in the United States, France and the United Kingdom, according to investment firm Research Affiliates, using data from the United Nations. Economists say it is rare for the number of working-age people as a share of the total population to fall in so many major countries at the same time. It’s usually because of war and famine, although such proportions also fell in the 1950s as baby boomers were born and populations surged. The six countries with declining proportions of working-age people now, plus China, accounted for 60 percent of global economic output in 2012, according to Haver Analytics, a research firm. The drops are small, a few tenths of a percentage point each year off proportions of working-age people, which had peaked in developed countries at 61.4 percent in 2009. But Research Affiliates expects the working-age share of total population to fall steadily for several decades, slowing economies each year, until they bottom at about 50 percent in 2040 or so. A country can compensate for this demographic drag on economic growth by encouraging people to work longer or to use technologies to increase output. But most economists doubt that such changes are forthcoming or would be enough. “You need incredible productivity growth,” says Michael Feroli, a JPMorgan economist. He says economic growth of 3 percent is unlikely on a “sustained basis” even for the United States, which is blessed with a flow of immigrants, albeit a slowing one, to soften the blow. It was an unusual confluence of beneficial demographic shifts, and perhaps unrepeatable. It’s already on its way. From 1960-2000, GDP per capita rose an average 2.6 percent a year in the big six developed countries. Since then, it has grown less than 1 percent a year. Arnott thinks the demographic drag is going to worsen, subtracting roughly a percentage point from the annual rate in the next few decades. That suggests living standards barely growing, or even falling. Andrew Cates, senior international economist for UBS in Singapore, worries that people accustomed to living better each year won’t accept the new slow-growth future and will demand change through protests. “It’s a recipe for social instability,” he says. Others note that smaller families are associated with some social benefits for societies. Births have plunged in countries where education has improved, the middle class has expanded and women have gained more freedom and rights. Still, even optimists see the world at a delicate crossroads. Reiner Klingholz, head of the Berlin Institute for Population and Development, says societies are unsure of their goals now that easy economic expansion is over. “We have no plans for how to run a society without growth,” he says. Second, retirees don’t save, invest and spend as much as workers with paychecks. That, in turn, cuts demand and slows growth. A third reason is less obvious: Productivity of workers, or output per hour, tends to peak as they reach their mid-50s. And the increases in productivity as they near that age tend to be small. And with economic growth, only the change in productivity from year to year counts, not the level. In other words, you may be very productive at work, but unless you’re becoming even more so each year or work more hours, you’re not helping the economy grow. And older workers past their peak productivity, by definition, subtract from growth. Births have sprung back after plunging in previous economic crises, like the Great Depression. But back then many women didn’t have careers, and they were expected to have big families. 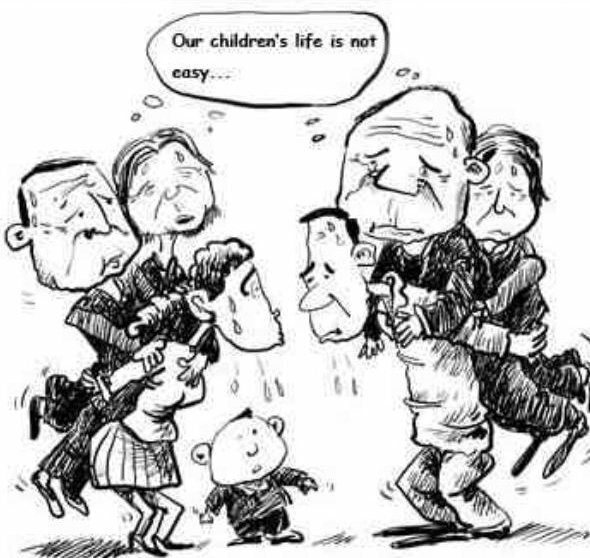 When the economy recovered and they could afford more children, they had them. Some factors potentially could offset lower birth rates and help fuel economic growth. Lower unemployment rates would help. As hiring has picked up in the United States, people who had stopped looking for a job out of despair have started hunting again, thereby expanding the labor pool. Countries can better educate and train their existing workers, attract more immigrants and encourage people to work past retirement age. One hopeful sign: In April, the U.S. Labor Department reported that 19 percent of Americans 65 or older were either working or looking for work, up from a record low of 10 percent in 1985. AP researcher Fu Ting in Shanghai and AP writers Frank Jordans in Berlin, Colleen Barry in Milan and Youkyung Lee in Seoul, South Korea, contributed to this report. Curse a police officer in the name of Jesus Christ??? The short answer is yes, a police officer, or anyone else can be cursed in the name of God, which is Jesus Christ, as long as God wants that one cursed. They can also be blessed, as long as God wants them blessed. There are consequences to incorrectly cursing and incorrectly blessing… “And I will bless them that bless thee, and curse him that curseth thee…” The Lord does not approve of friendly fire… or of giving aid and comfort to His enemies, the soulless, sociopathic, wicked tares that inhabit this earth, living along side His salt of the earth, good and well meaning people (the wheat and the tares). LAS VEGAS — A lawsuit has been filed against the Humboldt County Sheriff’s Department alleging deputies there are unlawfully seizing cash from motorists traveling on I-80 toward California. One of the questionable stops was captured on dash-cam video. Deputy Lee Dove can be observed and heard on the video as he talks with a driver he pulled over. The Humboldt County deputy never finds weed in the car he’s searching after a traffic stop on I-80, but he does find $50,000 in cash and $10,000 in cashiers checks. Dove is suspicious because the driver gave him conflicting answers to his questions and he tells the driver he’s confiscating the cash. Deputy Dove doesn’t arrest or even cite the driver, but he offers him a deal. The driver can sign a release abandoning the cash and keep the cashiers checks and go on his way. “The public did not respond positively to this,” said Dee Holzel, a local blogger. Holzel is a Winnemucca blogger who takes the temperature of the town at the Global Espresso coffee shop. She’s keeping a close eye on these currency seizures along 1-80. She’s concerned that it’s not always people with large amounts of unexplained cash. “Little numbers, amounts as small as six or seven hundred dollars that anybody might have in their pocket if they were taking a trip,” Holzel said. “Some of them are drug dealers, some are innocent people, but that’s not the point. The point is — none of these people should be having their cash taken from them without having evidence of them committing a crime,” said Matt Lee, a target of a cash seizure. Lee wrote about his experience on Holzel’s blog. Though he was never charged or even cited for anything, Lee had $2,400 taken from him by Deputy Dove as he drove to California from Michigan to look for a job. “I don’t think many people know what the asset forfeiture laws dictate. What’s allowed to be done? And I think if people knew, it would be overturned in a heartbeat,” Lee said. Lee can’t discuss the details of his case because, like some others, he signed a confidentiality agreement with Humboldt County in order to get his money back. “They’re buying their silence with their own money,” said John Ohlson, Lee’s attorney. “You got to differentiate between the drug trafficker and the guy who, you know, is going to gamble or likes to carry cash or doesn’t trust banks or something,” Ohlson said. He helped Lee get his money back and got $50,000 returned to the driver shown in the dash-cam video. Ohlson has also filed a class action lawsuit on behalf of others who have had cash taken. He says he understands the logic of drug interdiction, but thinks the logic Humboldt deputies are using is flawed. “They sell weed in California. These people were heading to California, therefore their intention was to buy weed. Even if that logic was true — which it’s not true — it doesn’t matter what your intention was,” Ohlson said. Holzel and others are calling for an investigation — of the cash seizures — that’s independent of the local district attorney and sheriff. “If everything’s on the up-and-up, awesome, That’s great. But we would like, I think the majority of people would like, it looked at by an outside agency,” Holzel said. LAS VEGAS — If someone with a gun stops you and takes your money — would you call police? What if the person who takes your money also has a badge? One deputy in particular is being singled out for his practice of pressuring travelers to abandon their money or face losing their cars as well. The I-Team has obtained exclusive dash-cam video from one of these drug interdiction stops. While no drugs were found, that didn’t stop the deputy from grabbing the cash. 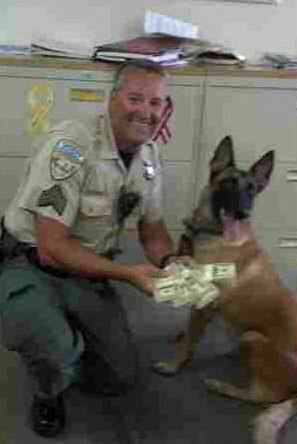 “How much money you got?” Humboldt County Deputy Lee Dove can be heard asking on the video. Dove can be seen dropping cash on the hood of the car. The dash-cam video gives insight into what some say is a pattern of questionable drug interdiction stops by Deputy Dove along I-80 near Winnemucca in northern Nevada. The out-of-state motorist was stopped for doing 78 mph in an 75 mph zone. Deputy Dove finds $50,000 cash and $10,000 in cashiers checks during a search of the car. The first issue is whether Dove obtained permission to search the car or whether he simply told the driver, Tan Nguyen, he was going to do it. But Dove never seizes the money under state forfeiture law, instead he offers Nguyen a deal. Abandon the cash and you can leave with the cashiers checks. Otherwise, Dove will confiscate the cash anyway and tow the car because Nguyen’s name isn’t on the rental agreement. Deputy Dove: “It’s your call. If you want to walk away, you can take the cashiers checks, the car and everything and you can bolt and you’re on your way. But you’re gonna be walking away from this money and abandoning it. “Our sheriff and our DA have said there’s no wrongdoing here,” said Dee Holzel. Holzel is a Winnemucca blogger who wants an investigation of the I-80 cash seizures that’s independent of the local district attorney and sheriff. “What they said initially was, ‘well, these are civil forfeiture programs. These kinds of things happen everywhere. There’s nothing unusual about Humboldt County.’ But that turned out to not be true. When you have people by the side of the road and you’re having them abandon their money so they’ll be allowed to get in their car and drive away, they don’t do that everywhere,” Holzel said. Critics believe deputies have been avoiding court oversight by leaning on drivers to abandon their cash rather than seizing it and giving warnings rather than tickets. “If they’re given a ticket, they got to show up in court and say, ‘hey, wait a minute, I wasn’t speeding and besides that, this guy took my dough,'” said John Ohlson, Nguyen’s attorney. The I-Team caught up with Deputy Dove at a K9 training event in Winnemucca, but Dove declined a television interview. The sheriff’s office released a photo of Dove with Nguyen’s money following the traffic stop, saying the money would be used to help fight crime. However, the money was eventually returned to Nguyen along with $10,000 in attorney fees after Nguyen sued the department. “An armed person stops a traveler and demands the traveler’s money and tells the traveler that unless he gets in his car and moves on down the road and forgets all about it, he’s going to take his car too. I would say that’s pretty close to what you’re describing as highway robbery,” Ohlson said. Law enforcement agencies can bolster their budgets with cash they seize, but there must be clear and convincing evidence the money is connected to crime. The question is whether deputies pressed drivers to abandon the cash so the rules of civil forfeiture wouldn’t apply. It’s a technique that may work well on real drug dealers, but critics say it also ensnares innocent people who find themselves tapped out in the middle of nowhere. Humboldt County Sheriff Ed Kilgore spoke with the I-Team and said proper procedures were not followed in a number of cases. He said, his officers no longer ask people to abandon their cash. If it’s suspected proceeds from a crime, the civil forfeiture process will be followed and people will be given their day in court, Kilgore said. He added, he thought the cases were being sent to the district attorney’s office and being handled as forfeitures, but some were not. That was the case with Tan Nguyen’s money. “We want to do the right thing. I am a strong proponent of fighting the war on drugs, and I want to make sure everything we do here is on the up-and-up,” Kilgore said. WASHINGTON — A record surge in recent firearms production and transactions have swamped the federal government’s automated registration system for select weapons, including machine guns. In a notice earlier this month to the firearms industry, the Bureau of Alcohol, Tobacco, Firearms and Explosives said it was temporarily suspending parts of its computerized system to shore up capacity in part to process the required registration and transfer of National Firearms Act covered weapons, which also include silencers, short-barreled shotguns, short-barreled rifles and some explosive devices. Between 2005 and 2013, firearms act-related applications “skyrocketed by more than 380%” to nearly 200,000, according to the April 16 memo issued by ATF Deputy Assistant Director Marvin Richardson. The surge has contributed to a backlog of more than 70,000 applications. The application deluge tracks a record annual increase in overall firearm production to more than 8.5 million guns in 2012, the most recent year for which the ATF collects such data. In 2011, there were 6.5 million firearms produced. 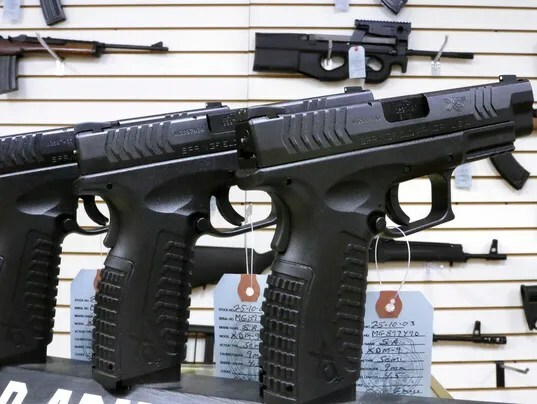 The increase was aided by a spike in the manufacture of rifles and pistols, continuing a trend that has been highlighted by industry representatives for the past several years. “We have seen dramatic, unprecedented … growth in the firearms and ammunition industry as the direct result of consumer demand for our products in the last five years,” the National Shooting Sports Foundation, the gun industry’s trade association, said on its website. “Not surprisingly, growth has placed added demand on the (ATF’s) Office of Enforcement Programs and Services. According to ATF records, a total of 512,790 machine guns were registered across the country in 2014, more than 571,000 silencers, 2.2 million so-called destructive devices (which include grenades and other explosives), 137,201 short-barreled rifles and 131,951 short-barreled shotguns. The automated ATF processing system was launched in 2013, but grew exponentially from 673 users last year to 10,000 today. What if your own government was the enemy??? Who writes the laws that congress does not read?? ?